Langley Aerosol Research Group Experiment (LARGE) measures ultrafine aerosol number density, total and non-volatile aerosol number density, dry aerosol size distribution from 0.01 to 10 mm, total and submicron aerosol absorption coefficients at 470, 535, and 670 nm, total and submicron aerosol scattering coefficients at 550 nm, and total scattering and hemispheric backscattering coefficients at 400, 550 and 700 nm. LARGE derives aerosol size statistics (mode, number and mass mean diameters, etc. ), aerosol surface area and mass loading, aerosol extinction, single scattering albedo, and angstrom coefficients. 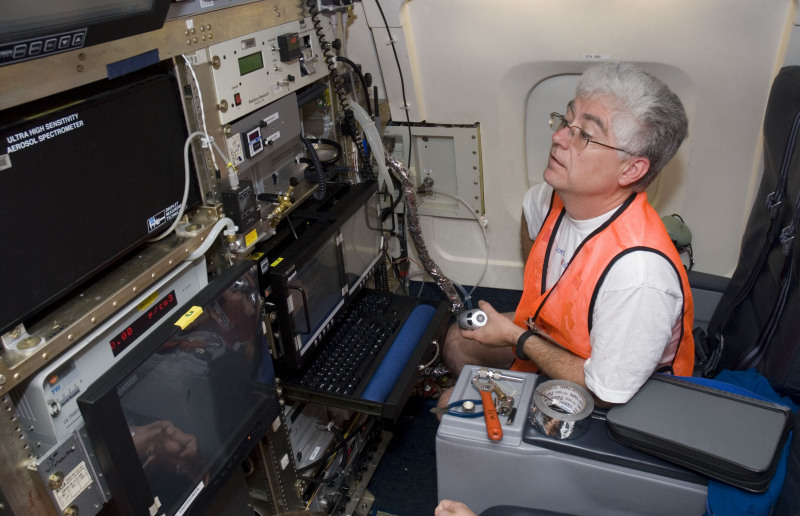 In situ aerosol sensors include condensation nuclei counters, optical particle spectrometers, an aerodynamic particle sizer, multi-wavelength particle-soot absorption photometers, and integrating nephelometers.